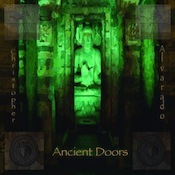 Christopher Alvarado taps into the mysteries and rituals of primitive cultures on his new release, Ancient Doors. While not a “tribal” release per se, these twelve tracks definitely delve into a primal space, pushing forward on varied percussion and atmospheres thick with incense smoke, but also weave in some new-world grooves for an original glide. The balance is the strength here, and Alvarado is clearly at ease working both sides of the equation, alone or together. “Dakini (Sky Goer)” is a great example of this mix, rising out of misty drifts before it starts pumping along, catching hold with its chugging rhythm. There’s something pleasantly raw about the sounds forming that rhythm, and they way they counter the fluidity of the pads. “Jewel of the Jackal” is another, a Mediterranean fantasy where sharp raps of the tabla and flavorful strings like sitars melt into a hypnotic sway. Alvarado builds up to a frenzy, then just fades it away like a breath. Probably my favorite track here. On the more tribal/primal side, “The Lock of Past” is a great atmospheric track. Drums distantly hammer out a dance as Alvarado ramps up the drama. Static-washed hisses and chant samples blend into the sound. On the more ethereal and sometimes dark side of the equation is “Dunes,” pairing long ambient pads with a keening vocal sample and more of the Middle Eastern flavor that runs through the disc. Later, that voice gets a different treatment in this tune’s “Drifting Wave Mix.” There, it’s clipped and chopped and used as a rhythmic element for a glitchy feel. It plays nicely against a meaty bass line and cool strings for a silky overall flow. Meanwhile, back on the quiet side, “Andromeda at Dusk” is a slow-moving ambient piece with a calm-breath movement. It’s a perfect closer that mixes its hush with just the right amount of shadow. There’s a lot of visual imagery at play on Ancient Doors, and several of the tracks have a soundtrack-ready sensibility to them. (Understandable, what with this release coming from Aural Films, whose motto is “Soundtracks for films that do not exist.”) Alvarado’s sounds run very deep, creating fully described spaces that evoke a lot of emotion. As I said before, it’s the mix of modern feels with old-world sounds that works best for me here. It makes the music easy to get caught up in and a pleasure to come back to. Check it out for sure.